History records that King Harold and his army took two days to walk from London to the site of defeat in the Battle of Hastings in 1066. But a military expert from Kent says there is no way the Saxons could have marched the 58 miles that quickly with their armour and equipment. So Dave Kinsey - and his family - are walking about half the distance in full Saxon costume in a bid to prove history is wrong. 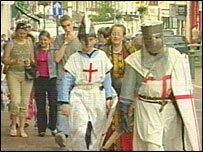 He hopes to raise £1,000 for charity as well as making his point, some 937 years after the event. Tradition says the Battle of Hastings saw William the Conqueror's Norman forces overcome Harold's Saxons on 14 October 1066, with the king being killed by an arrow in the eye. The anniversary is still celebrated, with 14 October marked on the local calendar as Hastings Day. Mr Kinsey and his wife and 12-year-old son are not walking from London to Battle, the town just outside Hastings which now sits at the site of the battlefield. They are walking from through Kent from their home town of Maidstone to Canterbury - just under 30 miles, but Mr Kinsey insists his point will still be proved. The walk started on Thursday, when the group left Maidstone Town Hall at 0545 BST and they expect to arrive at Canterbury Cathedral about midday on Saturday. Their progress has already been interrupted by stops for interviews with the media and a pub lunch - which presumably was not the case for Harold and the Saxons. Mr Kinsey is weighed down with about 70lbs of chain mail and armour for added authenticity. Mr Kinsey told the BBC on Thursday: "The Saxons, or part of the Saxon army, marched from London on about 11 October, to Battle in Sussex, a distance of about 58 miles, that they claim was done in either three or two days. "That means an average speed of possibly 29 miles a day, and it's not possible, or I don't believe it's possible in the conditions and with the equipment. "I'm so used to dealing with history being written by the winners, being spun, things being left out. "Too many people have spent too much time accepting that if it's in a book it has to be fact." The Kinseys aim to raise £1,000 for the Heart of Kent Hospice.